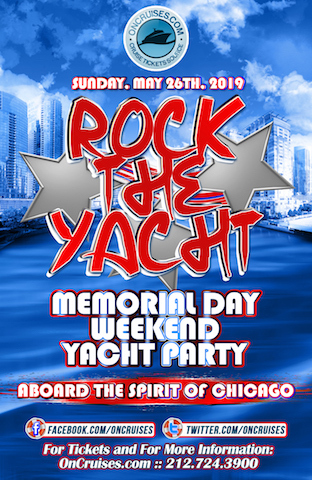 This year, spend your Memorial Day weekend The Lake aboard with us aboard the Spirit of Chicago. Let's meet at Navy Pier for a night of good music, chill vibes, and excellent views of Chicago’s skyline. So what’s the holdup? Get tickets to this Chicago Memorial Day Weekend cruise today. Hurry, before tickets run out. Make your way down to Navy Pier and board Chi-Town’s best-kept secret, The Spirit of Chicago Yacht. This multi-leveled beauty is the perfect spot to party like a pro. All 3 of the interior decks are climate controlled, with open areas on the ends of the 2nd and 3rd deck. There’s also a wide open sky deck. This Chicago Memorial Day Weekend cruise will give you plenty of opportunities to get great pictures of the sights to see. Sights like the Adler Planetarium, The Aon Center, Grant Park, and the rest of all the Chi-Town’s gorgeous skyline. Rest assured, you’ll have more than enough space to move around and get comfy. And that space will be put to good use as our live DJ keeps the party moving with a mix of the hottest tracks in Pop, RnB, Hip-Hop, Dance, Electronic, and Top 40 Hits. Head to one of the bar areas located in the vessel and let one of our bartenders fix you up a superb drink of your choice. Okay, That’s The What, Where, And When…. So all that’s left to ask is why haven’t you ordered your ticket yet? Don’t hesitate, tickets to this premier Chicago Memorial Day weekend cruise won’t last forever. C’mon, you know you want to go, so just scroll down secure your spot on this epic cruise. We know how much you love taking pics and vids from your phone. But don’t be stingy, share those awesome moments on social media so the rest of us could see. And we want to see them too, so remember to tag us on Facebook, Twitter, and Instagram. While you’re at it, you should definitely use one of our hashtags, like #OnABoat, #YachtyOnTheLake, & #ChiTownCruise.